A May 2016 update to this post can be found here. In getting to my door, KEF’s LS50 (AU$1999) took the long way around. Having first heard them sometime in mid 2012 and then again later that year at RMAF, I’ve been pestering KEF HQ about a review pair for some time. Months passed and as the reviews tumbled down my professional interest began to wane. How could I further advance a conversation that was already bursting with accolades? …however, my personal interest only intensified. Drivers: 5.25″ aluminium-magnesium alloy woofer, 1″ wave-guided aluminium tweeter, “Uni-Q” coaxial configuration, crossed over at 2.2kHz, 79Hz-28kHz frequency response, 85db sensitivity. Boxes: 12″ x 8″ x 11″ dimensions, MDF construction except convex polymer front baffle (to minimise diffraction), elliptical rear port with flexi-foam mid-section (to minimise chuffing/distortion), vertical and horizontal internal bracing. Ahead of (this) LS50 coverage proper there would be a minor (de)tour. KEF’s X300A powered loudspeakers caught my eye – I winked back. 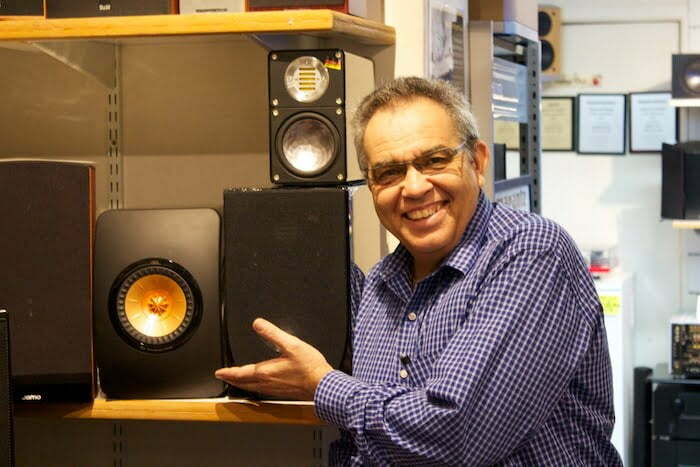 Before swiping the credit card on a pair of LS50 at Apollo Hi-fi in Sydney’s inner west, I first took time with the X300A to furnish readers with some broader context on KEF’s Uni-Q coaxial designs (trickled down from the Blade). In case you’re in any doubt (and as good as the X300A are) the LS50 outclass their powered siblings in almost every respect. The LS50 are warmer in the midrange, more inviting and enveloping and – with the right amplifier attached – FAR more dynamic. They sound simultaneously punctilious and suave. It’s the difference between a Jack + coke and a modestly priced single malt. Both can get you ripped but the latter takes one’s palette through more complex flavours. It makes me wonder if KEF has an active LS50 waiting in the wings? 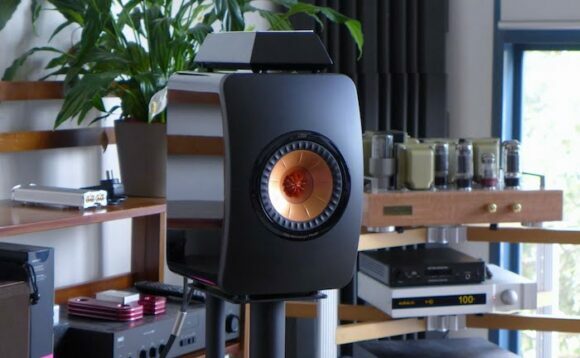 The LS50 were birthed to celebrate KEF’s 50th Anniversary. Their design is a future-facing take on an old standard, the BBC LS3/5a. I suspect the connection might be more marketing spin than genuine genetic extrapolation. Perhaps the (wo)men in white coats at KEF’s development lab in Kent instead asked themselves: what might the LS3/5a sound like today? Global brand manager Johan Coorg says the push for more radical aesthetics came from Hong Kong mothership GP Acoustics. It’s a push that has paid off. The LS50’s rose-gold coaxial driver array is now unmistakable. So successful have they been with reviewers and the general public alike that KEF intends to continue the LS50’s production indefinitely. Rather than re-inforce the raves that precede this review, I thought I’d take a different approach. I asked myself: how do the LS50 compare to the (mostly British) standmounts that I’ve owned/borrowed over the past couple of years? Also, which amplifiers to hand work best? Standmounts don’t go as low as floorstanders as a rule. But many contemporary models are pretty darn good with implying a sense of bass, even if they don’t do so explicitly with chest-thump impact. I’ve spent weeks and weeks on end with PMC DB1i and TB1i, ProAc Tablette Reference 8 and 1SC, ATC SCM 7 and 11 and 19, Rega RS1, Harbeth P3ESR and C7-ES2, Spendor S3/5se and S3/5r and SA 1. If you’re expecting pipe and slippers from KEF here you’re in for a rude awakening. Put away that knee-blanket, no afternoon nap for you! I’ve spent considerable time with. Aside from Harbeth’s P3ESR, Spendor’s SA1 – a sealed design – are the least rock n roll in the aforelisted boxes and yet I’ve consistently name-checked them as my favourite in the sub-$3k standmount category because of their talents with imaging, tone and transparency (particularly with voices). This pick of the pops now shifts to KEF’s 50th birthday badboys. The LS50’s top-end is as smooth as that of the Spendor SA1 but that’s pretty much where the similarities end. The LS50 release more upper-frequency air than the SA1 and the ATC SCM11 but not as much as the ProAc TR8 (which sizzles) or PMC DB1i (which sparkles). The rear-ported KEF isn’t transmission line like the DB1i but bass goes considerably deeper than even the PMC. Bass integration is also better on the KEF. Nothing images like a ProAc? 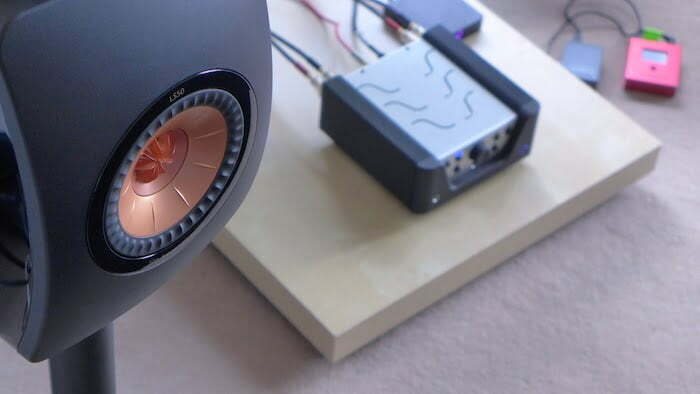 The LS50 do – that’s ‘Uni-Q’ coaxial magic at work. Music emanates from a space between and behind the speakers, seemingly physically disconnected from the boxes spinning the aural illusion. Excitement and dynamics are more up in yr grill with the LS50 than the Spendor SA1 – they present closer to the PMC DB1i’s “where’s the party?” vibe without giving up anything in the midrange transparency department. There’s also some of the tonal fatness that I enjoy in the ATC SCM 11. 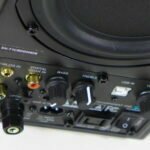 Good news too on the mid bass hump front: on the LS50 there isn’t one. They’re also not as power-hungry as the ATCs. In short: KEF have designed the ultimate all-rounder, go-anywhere-do-anything standmount loudspeaker. Good show. Typically with such a revealing monitor, matching electronics requires careful thought – and experimentation – lest the LS50 spill into brightness or get all loosey-goosey with lower Hz. 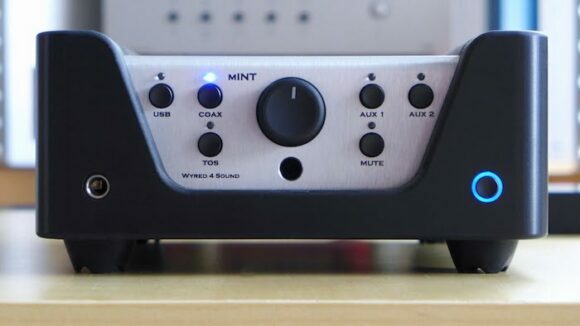 w/ Wyred4Sound mINT (US$1499/AU$1550). Remember my friend Andy? The chap whose Mrs makes him hide all the electronics behind the couch? If Andy were to own LS50s, this would be a smashing starter unit – shoebox dimensions means it can be tucked out of sight with ease (although I’m not sure what the implications would be for headphone use). It’s the Jack Russell of integrateds – feisty, furtive (surprises ahoy) and fun. Best of all, it packs an onboard DAC that isn’t terrible. These KEFs need at least 200 hours burn in, after which they commit to deeper bass and a much cleaner treble – think: tenderness on the roof of the palette. There’s more ambient detail and lower (better!) bass on offer than the ATC SMC7 or Spendor SA1. More kick than a ProAc Tablette Reference 8, not quite as much pizzazz as a PMC DB1i (but superior bass integration). The Wyred4Sound will get you up and running. Class D means the punch of an 808 won’t sound flabby and I heard zero evidence of midrange standoffishness that many Class War-ists attribute to ICEPower. Au contraire. What I initially thought was a hint of lower-treble glare from the USB input turned out to be one of the LS50’s many twists and turns during run-in; it eases but never vanishes completely. That’s great news for spatial cues and you-are-there presence but not so good news for partnering amplifiers that serve up the same. The mINT is better suited to the more laid back (outgoing) Magnepan MMG. Back with the KEFs, vinyl listening through the mINT’s auxiliary input proved to be ultimately less glassy than direct USB. W4S’s on-board DAC gets found out with speakers this revealing. It takes the Resonessence Concero as USB-S/PDIF converter to smooth things out again, which draws the blinds on that 4kHz-ish illumination but also takes the shine off having everything tucked into one unit. w/ Weston Acoustics EL34 Topaz (AU$1800). 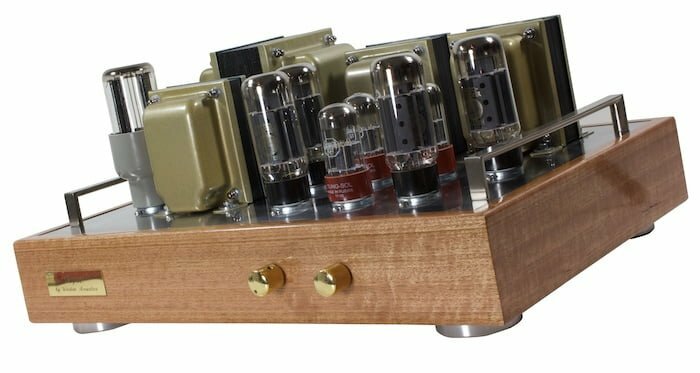 Each time I look at this amplifier I ask myself: how can it sell for only AU$1800? Winding transformers by hand is a time intensive process. The point-to-point internal wiring isn’t tossed off in a lunch break. Love and care goes into every amplifier and Earle Weston keeps each buyer up to speed on their unit’s build progress with regular email dispatches and photos. Everything about the hand-made Topaz oozes quality. Sometimes there are benefits to being an audiophile down under and the Mornington Peninsula’s Earle Weston is one of them. Those in the know keep Weston’s amplifiers in high demand; wait time runs into the months (not weeks). Each time I connect up this amplifier I ask myself: how can it sell for only AU$1800? It’s cheaper than an Audion and the push-pull design gives it sufficient oomph (35wpc) to take charge of the LS50. However, it does so with love and tenderness. It makes all music sound beautiful, as if each note were caressed into life before being sent onwards down the chain. The lowest frequencies occasionally bulge with some sagginess – that’s to be expected here – but it’s easily mitigated with the port bungs that KEF supply with each pair of LS50. Much like the X300A, each bung separates into two concentric pieces – use the outer if you’ve a big room and you don’t need to vanquish that last soupçon of heft or push in both outer and inner for that sealed box vibe. Weston’s EL34 design might not be the perfect sweetheart for when the LS50 go courting – but what is? If you prioritise elegance over bombast, this is the amplifier for you. That’s why it’s my number one choice with the more efficient Zu Soul MKII floorstanders – no question. This is where speaker-amplifier romance blossoms. w/ REDGUM RGi60 (AU$1850+). This is my favourite LS50 dance partner – no question. It’s got guts and refinement. The ultra-reveal of the KEFs pulls back the curtain on a treble that’s pebble smooth and the best and BIGGEST bass of all three contenders. They might be standmounts but the REDGUM squeezes the lowest notes of Jon Hopkins’ “We Disappear” out of the KEFs’ rump without any loss of shape or unpleasant smearing (no pun intended). This is exactly why REDGUM amplifiers are known for their high current delivery and low frequency endowment (without Ian Robinson and Lindy Gerber resorting to the cheap sloganeering of “the best bass in the world”). REDGUM are more humble and deserving of broader recognition. The outward aesthetics of the REDGUM oeuvre might not be to everyone’s taste but once you hear one, it’s tough to go back to what you had previously. Chuck another log on the homefire, Eugene – just be careful with that axe. Back to W4S. I concede that including the mINT in this three-way standoff isn’t particularly fair on EJ Sarmento (and his team). It’s an all-in-one offering that packs considerably more features than each of the Weston Acoustics and REDGUM units. To right that wrong I’ll soon be heading down a path that will see the KEF LS50 do turns with Wyred4Sound’s monoblocking mAMPs (US$899 each) and the Mytek Stereo192-DSD (US$1495) as pre-amplifier. You are so spot on about Earl’s amps. Simply amazing what he does for the money. 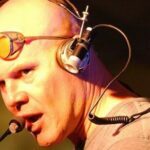 Not the last word in speed and bass grip but my oh my what it does, it does so well – the right material (read that as forget about Rage Against the Machine and some highly dynamic material) sound divine and it’s up there with the best I have heard. Love the LS50’s as well. At its price point very hard to beat – only for about $1K more can I think of anything better. But to be fair they shine on the type of music I love – if I was into Rage Against the Machine it may be a different story. Thanks for the shootout John! Did you get to pair the LS50 with the Exposure? I suspect this would be a ‘fun’ experience! Sorry Clem – the Exposure is long gone. Easy: because I don’t have the mPre (yet!) and I wanna investigate how well the Mytek plays that role. I’m looking for standmounts with more articulate bass than my Proac Studio 115s. Wondering if these might be the ticket. Don’t want anything that needs to be way out in the middle of the room to sound right either. Really enjoyed the LS50 at THE Show. It’s low efficiency is the really only issue I have with them. At 85dB you need to bring some amp to the party which IMO is a little out of character for mini-monitors. If I have the space and budget for bigger amps then I would probably do bigger speakers. I could seeing these being an awesome transducer for lower-watt apps if they were 88db-ish. But yeah, if you have the space and budget for a big amp, yet are looking for tiny speakers at a very fair price point then they would be hard to beat. Great sound for the money. And I love the rose-gold accent. Very forward looking…tasteful color is the new black. On the contrary – standmount speakers are usually less efficient than the equivalent floorstander, and often come into their own when driven by more powerful amps. I’m a BBC/LS3/5a fan from way, way back. I currently have the LS-50’s and love them. Finally, after 36 years, a speaker I like better than the LS3/5a. I’ve heard so much about these, and I’m in the market for a new set-up. I’m really tempted to buy a pair of these and a Luxman integrated and call it a day. Boom. The only question is… which Luxman? P.S. What do you have sitting atop the LS50? How do the LS50 sound with the Wadia 151 DAC/amp? I guess I was expecting a lot (too much!) after the miracles it worked with the MMG but, alas, it came up short on grunt and sounded too thin/reedy. Thanks for another great and very informative review. I’ll be waiting for the dedicated stands from KEF that the aforementioned Mr. Coorg confirmed were coming when I asked at the Newport Audio Show. Of all the demos I attended there it was these LS50s and the Magnepan Super MMGs that impressed me most. I agree – both a *superb* speakers. That’s a good point… For LS50 money you are talking Maggie 1.7 territory, and they are even 1 dB more efficient. Both ~4ohm speakers. That would be a hard call and would depend mostly of you available space and WAF. I’d assume both would place similar demands on amplification. Thanks for the write-up John. Budget amp selection for the LS50s is something I’ve been interested in since purchasing a pair 6 months ago. I’ve tried various (Brio-R, Exposure 1010, Myryad Z142, Arcam A28, Burson PI-160 to name most). Pretty much all genres gets played in my home and for me the pick of these amps was clearly the Burson. I also had a soft spot for the Myryad – which are a well built affordable amp if you can find one. I’m currently using a Onkyo A-9070 which has matched up well but the best to date has been my Unison Research Unico P integrated. Reasonably powered hybrids are definitely worth trying with the LS50s which as you pointed out are a solid all-rounder with great imaging. Particularly if you listen at low-moderate volumes. I can imagine the Burson gear being a great match. Might have to investigate a pair of Timekeepers. Just wondering how the 47 Labs Lens stack up to these. I’m hoping to upgrade soon and the LS50 are on in my sights. LS50s are MUCH better value for money and a more all-round speaker. Lens not so hot with the most dynamic rock n roll. Has anyone listened to the ls50 s with a peachtree nova 125? I have and I like it very much. The 125 has the power to take the LS50 by the balls (so to speak). I have a pair of LS50 connected to a Rega Brio-R and a Rega DAC and I can tell you this amp has enough power to beautifully drive the LS 50. Anyone else out there had experience with this combination? On a rega brio-r…how would you go? LS50 or save and look at ML1’s. I don’t think the Rega will have sufficient guts for the ML1s. I own a Redgum RGI60 here in the US and I’m not surprised that it won this competition. No major US magazine has reviewed it, yet it will beat every other integrad in it’s price class including the Naim 5i and a host of others. It sounds very dynamic and “alive”. Redgum audio needs more exposure here in the US. It sure does Alan! Not that this was a competition. 1) Atacama Nexus 2) Doubtful but I can’t be sure as I’ve heard the Nait2 do crazy-good things. 3) Yes! Hey, thanks for the great review . From your experrience, if you had to choose between the following amps for the LS50, which one would you choose? I cant decide between them. Hey Ran – only had quick listen to the Nova125/KEF combo. What I did hear, I liked. I see, but would you recommend the mint? Just sound quality wise – becuase you did mention that it might be better with a more laid back speaker. Yes, I would. The KEFs are sufficiently relaxed to be benefit from a kick in the pants. Sorry Will – brain malfunction on my part previously, now corrected. Only had a brief listen to the nova125 with these KEFs but I found it to be an enjoyable combo. I still prefer the W4S mINT over the Peachtree though. Thanks for another great review! I know they’re completely different designs, but since you have them both, would you swing for the LS50 or Zu Soul if you had to pick one? Alas, I’ve yet to hear those CI D100 monos. They look good on paper and if Jeff Dorgay says they are neat performers then they are neat performers. 1) I know it’s hard to answer in a short sentence, but do the ETI toppers make a positive difference? 2) I have paradigm Studio 20 v.5. I don’t know if you have auditioned them, if you have would you consider these KEF’s a worthwhile upgrade? 1) Actually, my jury’s still out on the ETI Toppers. I can’t pick a difference with the KEFs and neither could my buddy. And that right there is an issue if you’re dropping $800+ on a tweak. 2) I don’t know those Paradigms I’m afraid but I can tell you this: I’ve not heard a better standmount than the LS50 at <=$2k. NICE comparisons with amplifiers! After nine montbs with LS50 and Emotiva 50 wpc “mini” amplifier, I am convinced the LS50 is EMINENTLY easy to drive. The LS50 is desivned from “zero” to a complete product. NO ADAPTATIONS anywhere, ESPECIALLY in the crossover region (where these drivers are specifically designed with the physics, shape, and materials to integrate perfectly with a SIMPLE crossover…the principal keys for amplifier friendliness). My perception is that the LS50 is exceptionally friendly to amplifiers, and any comparative differences are merely a transparent conveyance free from any speaker contribution. Finally got to hear(briefly) the LS50s over the weekend. Hooked up to a Rega Brio-r they sounded pretty much as I had expected. In a treated room – quite nice imaging as you mentioned. Transparency and bass, were also quite impressive. I may be wrong but I somehow suspect the bass would tend to be boomy unless given an amp with really good grip and a lot of room to breathe. I plan on giving them a better listen over the weekend along with the new Nait XS-2 and Rega Elicit-R. Some nice insights there Mike – thank you. John – for an outstanding value for money stand-mount – you must hear the Reference 3A Dulcet. If the LS50’s come anywhere close to the sound of the Dulcets I would be very surprised. Granted – the 3A’s are more expensive – but they are still a very affordable stand-mount – and even though more expensive – I still suspect better ‘value’ than the Kefs. Hello John, what about the intriguing new NAD D3020 driving the KEF LS50? I can’t wait for your listening impressions.